Fordham faculty visiting a women’s shelter in Nogales, Mexico. Standing: Diane Rodriguez, Father Michael McCarthy, Falguni Sen, Jacqueline Reich, Sister Alicia Guevara Perez (Kino Border Initiative), Katie Sharar (Kino Border Initiative), Ian Weinstein, James McCartin, Marciana Popescu, and Dana Alonzo. Seated: Carey Kasten and Glenn Hendler. Even at its closest point, the U.S.-Mexico border is roughly 2,000 miles away from New York City, making the current humanitarian crisis there seem like it’s happening in a distant land. This spring, a group of 10 Fordham faculty members traveled there to see it for themselves. 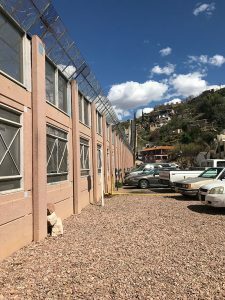 From March 17 to 22, they visited the Kino Border Initiative, a consortium of six Catholic organizations in the border city of Nogales—both on the Arizona side and the Sonora, Mexico side. Kino aims to promote border and immigration policies that affirm the dignity of the human person and a spirit of binational solidarity. The trip was funded by Fordham’s Office of Mission Integration and Planning and featured faculty from arts and sciences, the Graduate School of Social Service, the Graduate School of Education, the Gabelli School of Business, and the Law School. The group raised $13,000 to purchase toiletries and necessities for the migrants and documented their time on a blog. Members of the contingent got to see up close the wall that cuts through the city of Nogales. Jacqueline Reich, Ph.D., professor of communications and chair of the Department of Communications and Media Studies, co-led the trip along with Associate Professor of Theology and Acting Associate Provost James McCartin, Ph.D. It was Reich’s second time in Nogales, having worked with Kino in January 2018. Although only 14 months had passed since her last visit, the experience was very different, she said. 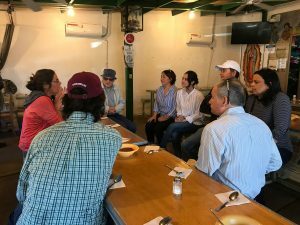 As before, the group stayed overnight in Arizona and crossed the border to work in a comedor, or cafeteria, in Mexico, that provided meals to people waiting for asylum claims to be heard in the United States. In 2018, she said, they would typically have one seating of 40 to 50 people—mostly men, a few women, and very few unaccompanied minors. This time, there were multiple seatings with 300 people per meal. “We spent a lot of time holding babies while people could eat, or entertaining children, or sitting and talking to groups of families that had left Honduras, Guatemala, or regions of Mexico that were affected by gang violence and poverty,” she said. The cafeteria where faculty members worked hosted several seatings of 300 people, including many families with young children. 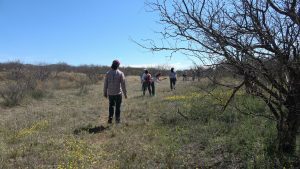 In addition to serving meals, the group hosted a party at a women’s shelter, met with border patrol agents, and hiked along the border to understand the conditions there. They also attended an “Operation Streamline” hearing in Tuscon, Arizona, where immigrants appear in a group before a judge, who often deported them for being here illegally after two quick questions. 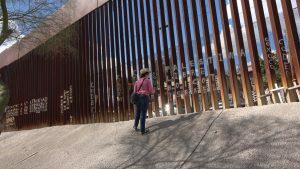 Glenn Hendler, Ph.D., a professor of English and American studies and acting chair of the English department, said he knew a little about the crisis at the border before heading there, but learned a lot from the trip. 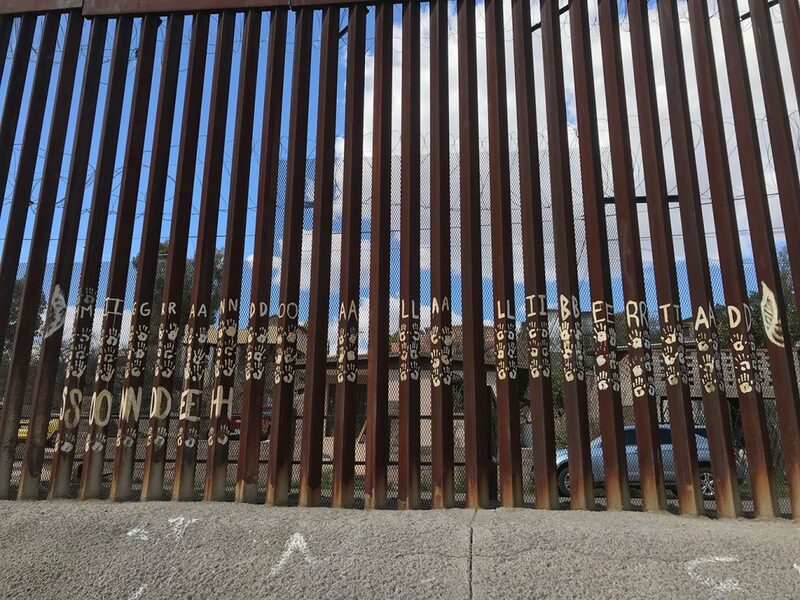 He was surprised to learn, for instance, that a wall was constructed through the middle of the Nogales in 1994, long before President Donald Trump made building a border wall his signature campaign promise. The Fordham contingent stayed on the U.S. side at night and crossed the border to Mexico during the day. Although he does not speak Spanish, he was able to connect with a 6-year old girl at the comedor whose father was washing dishes nearby. “It was an incredible joy to make a child who was going through a horrific experience laugh,” he said. Portions of the wall dividing Nogales have been in place in the 1990s. Carey Kasten, Ph.D., associate professor of Spanish, echoed this, saying she was moved by the possibility of future projects at Fordham. Her scholarship touches on issues related to the border, so she was familiar with the situation. But she was moved to learn things like why black water bottles are a must for those crossing the border at night. (They don’t reflect moonlight). “We were told to accompany, humanize, and complicate. To see those real items that our guide had collected on hikes through the desert, and also to see people get out of a van who’d been deported and go into the soup kitchen we were working in, was something that really stood out,” she said. She was also shocked at the level of needless suffering taking place. When people are deported to Mexico for instance, they are given back any cash they had on them when they were apprehended in the form of a check. But the checks are only cashable in the United States, so once a week, a nonprofit group called No More Deaths visits the comedor to help people cash them. She also wasn’t impressed with the judge who spoke to them after presiding over the deportation proceedings. The trip included a hike in the surrounding area to get a sense of the terrain. McCartin said the goal of the trip was to give faculty members an experience different from their everyday work life that would also then affect their work life. The group will reunite soon for debriefing and discussion of possible future plans. One conversation that will always stay with him happened when a man from Honduras asked him if Americans all thought they were criminals. “I said ‘Oh gosh, no, I have no problem with you.’ This guy was like, ‘Really? I can’t believe that.’ I said ‘No, I can see how you have a sense that that’s how Americans talk about you, and there are plenty of them that do, but there are also a lot of us that don’t really begrudge you trying to have a better life,’” he said. Michael C. McCarthy, S.J., vice president and presidential assistant for planning in the Office of Mission Integration and Planning, said the trip was a necessity, given how immigration is now a major global challenge. 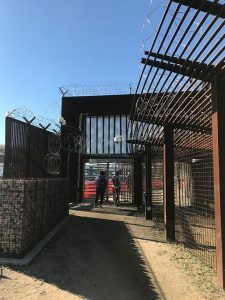 “Because this is such a major social issue and it impacts questions of justice, what we want to be as a society, and how a place like Fordham, as a Jesuit university, tries to develop students, we decided the border would be a great site for this immersion experience for a diverse group of faculty members,” he said. Reich is making sure the issue lives on, having structured the syllabus of one of her spring classes, Films of Moral Struggle, to include representations of borders and migration. The class is also sending Easter cards to people in detention at the border to bring a little color and humanity into their lives, she said. Above all, she said she’ll hold onto memories of conversations with the migrants she met, like one with a man at the comedor who was sporting a University of Michigan hat. He’d lived in the U.S. for 22 years before being deported after being stopped for a traffic violation. “I will always carry their stories with me,” Reich said. Photos courtesy of Fordham faculty.